A few weeks ago, I had the pleasure of not only designing welcome gifts for The Real Talk Workshop, but also attending it! This exquisite event took place at The Anderson House in the Dupont neighborhood of D.C. How much would you love to be welcomed by this beautiful architecture everyday?! May I move in, please?! This event was brought to us by Kir Tuben and Sarah Rizzi of Sincerely Pete Events. I’m so lucky to be able to call them friends! Their talents and knowledge led to one of the best and most gorgeous workshops I’ve ever had the honor of attending! 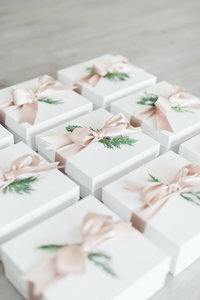 I sponsored the gift design along with some items inside, but we had other sponsors including Kendra Scott and Phoebe and June who also gave goodies to include inside each gift! Yay! Kendra Scott donated one piece of jewelry per attendee! This was such a nice gift for everyone to receive. It also was something pretty to style and photograph during the workshop! Phoebe and June donated journals to include in each gift. They were perfect for note-taking while listening to all the great tips shared by Kir! Real couple alert! How adorable are Ariel and Eric Lewis?! Pretty capture by my friend Brett Denfeld who was shooting while Kir was sharing all of the “Real Talk”! The guides Kir prepared were filled with tons of tips and looked lovely in each welcome basket. This macaron cake from Sweets by E was absolutely stunning! Aren’t these details gorgeous? It was so difficult deciding which ones to choose! There is an entire vault of beautiful images from this workshop! Just some of the pretty people in attendance….both vendors and attendees…. An airstream trailer that serves bubbly? Where has Toastworthy been all my life?! This cutie can pull up to your event and serve your guests all night! How adorable!! Check out all the amazing people who made this workshop possible! So many are invested in Kir and her workshop! Kir, thank you so much for allowing me to be a part of your gorgeous and educational day! I want to continue reliving this for a long time!